*Check back for seasonal listings. at an historic weaving studio, Millstone Plantation. We will learn 3 weaving patterns for a scarf, creating with a variety of nubby, glitzy, or textured yarns. With a special ambiance, Millstone offers a beautiful setting on Lake McBride, free-roaming sheep and alpacas, and great heritage oaks. Read more about my shepherding beginnings here with my 1st 2 lambs. Registration, at $150, includes a pre-handout, frame kit (yours to keep) and lunch. Contact Millstone for registration info. 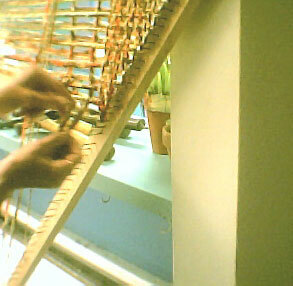 Contact Alice for weaving/yarn info. A creative gathering of fine artists and artisans, including munchies, entertainment, and a wide variety of art. Join us downtown, in the park, on the WEST side of Monroe St. In conjunction with the Chain Of Parks show, this is one of Tallahassee's popular art events. Look for my booth across the street from the DoubleTree hotel, where I'll have the latest weavings and some paper art, too. See more on my new handwoven capes, and other current items. Come visit the sheep, see the fiber process from start to finish, try your hand at dyeing, or weaving, or paper-making or fashioning a grapevine dream-catcher. For after-schools, camp field trips, or private parties. See more at my Dyed 'N Wool pages, or Tally 4 Kids. 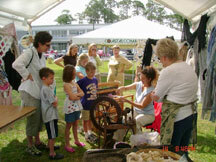 Join us for a fun weekend at an historic fiberarts studio, Millstone Plantation. A combo workshop, altho you may enter separately: Paper techniques on Saturday, and Book binding on Sunday. Millstone offers a beautiful setting on Lake McBride, free-roaming sheep and alpacas, and great heritage oaks. Registration includes a pre-handout, frame kit (yours to keep) and lunch. Contact Millstone for registration info. Contact Alice for papermaking info. Historic Seville Square, Pensacola: 9am - dusk. A national "showcase" show, The Great Gulfcoast Arts Festival, one of the best in the nation, celebrates a wide range of arts from music and performing arts, to regional & culinary arts, and best of all, to craft and visual arts. The Heritage Area especially honors those practices passed down through our culture, all in a notable setting of another historical art - architecture. After 37 years of participation,I'm still awed by its effect on the many visitors who come and support the artists every year. Look for me on corner of Zaragossa St. & Seville Square, surrounded by other weavers & spinners, potters, woodworkers, jewelers, glassworkers, and more. Various fiberart demos and workshops for adults or kids are available in Spinning/Weaving, Paper-Making, Natural Dyes, and crayon-batik. Many of these experiences are also available thru Artist-In-Education programs for public or private schools or disabilities programs, and may be funded thru local arts agencies. Dyed 'N Wool Art offers workshops for kids, birthdays, and summer camps and Just For Schools, activities for the classroom. Summer "Dyed 'N Wool" Art Activities include activities for groups or as a field trip for your camp. For primary thru middle school ages, small groups visit the sheep, see demos, and/or make individual projects. 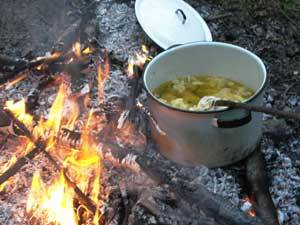 If field trips are not an option, I can bring all equipment, and maybe a lamb or two, to you. These activities are also great for birthday parties. See descriptions, photos, & much more on the kids pages: Dyed 'N Wool, or Just for Schools . Contact me for more info by email, or phone 850-997-5505. Artist In Education demo/workshops are available for P-K, special needs classes, After-Schools, Home schools, & Leon, Gadsden & Thomas County Schools, and in surrounding areas. Varied dates and locations. 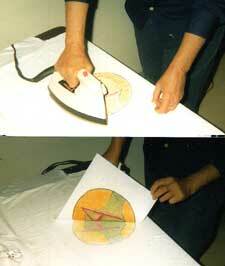 If interested in a visit, see Presentations page for sample demos. Contact me for info on coming to your school, organization, or event, or for holding a workshop at my studio. The triangle frame offers a great way to weave LOTS of texture & color into a simple wrap in just a few hours. 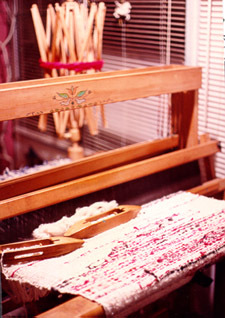 A unique process for beginning or experienced "yarn people", it weaves from two opposing corners at the same time.Use those colorful,glitzy, textured novelty yarns and also recycle leftover yarns from other projects to make a full-size shawl, scarf, throws, totes, curtains, etc. Optional frame provided (yours to keep), or DIY. We will learn 3 techniques, which you will continue at your own pace at home. Visit the sheep, and come weave at my "farmette", 291 Green Meadows Dr., Monticello. $70, +-frame: $25, through Visa/Mc (by phone), check, or Paypal. Pre-handout and map sent on registration. Call for details, 850-997-5505.or email me. See more info and many samples of projects & workshops: Classes. Ask for one in your area. See finished items at Triangle Weaves page. A fun process that yields wonderfully textured papers, to be used for cards, mats, bookmarks, photo or painting backgrounds, bookmaking, scrapbooking, or journaling. Or mold it into 3-D forms: boxes, planters, etc. We will make simple frames with embroidery hoops & screening, grind a mix of pulp from colorful junkmail and abaca fibers (for strength), and embellish with other fibers, petals, yarns, glitter, etc. See samples.